Climate change is often couched as an important problem of the sort which democracies fail to address — along with things like the global credit crisis, and fascism. But the failure is not with democracy itself, but with the calibre of certain actors within it. Climate change is an issue which should have been hit out of the park by any political movement with any competence, because the magnitude of the stakes and the weight of both reasoned evidence and benign symbolic matter which it embodies yield raw material for the most profound and powerful sorts of political campaigns — the sort which fundamentally change peoples’ beliefs and allegiances and which, if properly conducted, can grant a political movement incredible license to implement far-reaching policy of the sort which reforms society at its most basic levels. The Great Depression was just such an event for Franklin Delano Roosevelt and Michael Joseph Savage. The miners strike was for Margaret Thatcher. September 11 was for George W Bush. And so on. And yet, the skeptics are winning the battle of ideas around climate change. 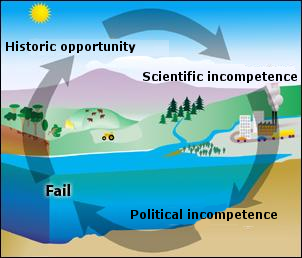 The failure to convince the electorates of the free world of the need for urgent climate change policy, a matter of the most critical and immediate importance backed by the best science available, reflects an utter failure on the part of political and scientific elites whose most important job it is to provide such leadership. The political and scientific establishment has squandered a phenomenal opportunity, with the exception of Al Gore, who with An Inconvenient Truth did more to progress the cause of gaining electorate buy-in to the topic than everyone else has done since. They are struggling and failing, not only to implement reforms of the magnitude which are required, but even to maintain the credibility of the scientific establishment. Some [including Ag, to whom this was originally addressed] argue that it was always impossible to sell climate change to the electorate due to the vested interests amassed against it, cognitive biases, lack of expertise, plain ignorance, etc. Those are important factors, but other factors are more important and more controllable to boot — after all, people in a liberal society can only really control their own actions, and must be prepared to defend their positions against others. The scientific establishment failed by allowing a tiny minority of skeptics and raving moonbats and vested interests to frame their establishment as a corrupt back-slapping club funded by grant money; by evading and prevaricating and playing dirty when legitimately challenged on important matters of fact and procedure; most recently by covering up emails and giving the conspiracy theorists grist for their mills. In defending their failures, they blame the heterodox minority, the vested interests, the rapturists and the conspiracy theorists. Politicians have failed mainly by couching their arguments in favour of urgent climate change policy in terms of hard facts and economic figures, assuming that people could connect the dots themselves rather than spelling it out in terms they could understand at a visceral or intuitive level as well as when they whip out their utility calculators. The politicians blame the same people as the scientists, ignoring the fact that a generation of failure on their part to adequately contest the battle of ideas and to safeguard the political process against the influence of vested interests has allowed such lobbyists to become entrenched. Part of this is systemic — there are problems with the scientific peer review system which politicians can’t understand; there are ruthless and well-resourced lobbyists with vested interests which have been permitted to entrench themselves in democratic political systems. But none of that is any excuse. They should have been able to drive it home anyway, given the raw material at their disposal. This is not a failing of democracy, but a failing of certain actors within the democratic system: particularly, those who believe so deeply that they are right, so they need not prove their case. People who think that inherent truth of the position will simply shine through. If their position was that strong, then it should have been easy, right? This ignores a fundamental reality of a free society: that people are free to be wrong, and must be brought about by reason and persuasion or not at all. I think it is that strong, and should have been easy. The world is going to pay for the failure of climate scientists to adequately protect their credibility, and for the failure of politicians and policymakers to adequately sell the most politically saleable concept of the past generation — that the planet is going to get inhospitable if we continue to pollute it, and we don’t have a fallback position — and it’s infuriating that those responsible for this failure want nothing more than to shift blame for their own incompetence. * It should be clear, but nevertheless: I’m not arguing that AGW isn’t real; in fact, the opposite: I am arguing that the problem is real but that the credibility of much of the evidence and the policy agenda is critically undermined. I don’t really buy Poneke’s conclusions drawn from his analysis of the emails, although I do accept that they demonstrate severe systemic and credibility failures which call a lot of the evidence into question. But in order to believe that it’s all a hoax, you have to believe in a scientific conspiracy of unprecedented scale, with no credible payoff. I just don’t see it. Parliament is sitting today, and the 2009 session rightly opened with a unanimous motion of support for those affected by the Victoria bushfires. The events themselves have been very thoroughly covered on NZ media and internationally, but what I’m interested in is the way in which our politicians have been speaking about them. So, a quick look at each party’s contribution to the debate of the motion this afternoon. John Key, National: Emphasised close cultural, economic and military relationship – “like no other”, and history of mutual support in times of need. Strong sporting rivalry means strong cultural ties. Firefighters as heroes who care not for borders and are an example to us all. Top-level links between himself and Rudd. Closed with “kia kaha”. Focused on the magnitude of the events on Australia, though a questionable choice of words with “the enormity of what is happening has burned into our consciousness”. Strongly-worded, statesmanlike, decisive. Phil Goff, Labour: Spoke for “all New Zealanders”, focusing on impact on families of victims and the “human tragedy” and loss of property. Used family and sport metaphors for the strength of the relationship, like Key. The offer of 100 firefighters “was a good first step”. Generally somewhat procedural, lacked the bite of Key’s speech. Russel Norman, Green: Very brief. Ticks off main points re support for the motion and assistance, and “respectfully note” the debate on climate change in Australia – but perhaps wisely doesn’t make too much of this. Rodney Hide, ACT: “All New Zealanders” and “brothers and sisters”, again. Moved quickly to Rudd’s “hell on earth”, then to the possible criminal element behind the fires, hoping that those who committed the “evil” of the arson receive their “just desserts”. He’s angry, first and foremost. Tariana Turia, māori party: Expressed sympathies in the first place to “the Australian Prime Minister Kevin Rudd” and then to those “families and communities” who have suffered – formally, she’s speaking as ariki ki te ariki, I think. Rather than using family as a metaphor, highlighted the fact that many New Zealanders actually have relatives in Victoria. Fire is “merciless”, families are “scarred’. Said her party would “support the role that this government and this country will play” as if she’s not involved or hasn’t been consulted about it. Jim Anderton, Progressive: “Brothers and sisters” again, emphasising global and historical magnitude of the fires. NZ being “compelled to share [victims’] grief”. Focused on rebuilding and the resilience and “Aussie dauntlessness”. Firefighters as heroes. Amazingly, he compared the fires to September 11 2001, rationalising it on the basis that the same proportion of population have supposedly been killed. Irony of flooding in Queensland at the same time. Generally a strong speech, but – September 11, WTF! At least he didn’t refer to the supposed arsonists as “terrorists”. Peter Dunne, United Future: “Kith and kin”. Enormity of the events – “Australia’s worst peacetime tragedy”, which is rhetoric reminiscent of post-9/11. Warns that life will take a long time to return to normal. Talks about media imagery a lot. Encourages people to be “as generous with their resources as they are with their sentiments”. I see a few true colours there, I think.